Rossiello, F., Fumagalli, M. and di Fagagna, F. d. (2013). ImmunoFISH for Mice and Baboons Frozen Sections. Bio-protocol 3(24): e1000. DOI: 10.21769/BioProtoc.1000. Frozen tissue placed in OCT without fixation. When needed, slice to the desired thickness (8-10 micron), dry the slides few minutes (often the time to prepare the other slides) and freeze again at -80 °C. The day of the staining, thaw the slides and fix for 20 min in 4% formaldehyde. Wash slides with PBS for 3 x 5 min at RT. Permeabilize slides with 0.5% Triton in PBS for 5 min at RT. Wash 2x with PBS 5 min at RT. Block in 5% Goat serum diluted in PBS + 1% BSA for 60 min. Incubate at 4 °C: 53BP1 #NB 100-304 (rabbit from Novus) 1:100 in PBS, 2.5% goat serum, 1% BSA. Use 60-80 μl for each slide. Wash once quickly and 3 x 10 min with PBS at RT. Secondary: goat anti-rabbit (Alexa 488) (1/100) in PBS + 1% BSA for 60 min at RT. Wash once quickly and 3 x 10 min with PBS RT. Re-fix tissue with PFA 4% + Triton 0.1%, 10 min RT. Incubate with glycine 10 mM in H2O, 30 min, RT. Wash with 1x PBS, 3 times, 5 min. Prepare the hybridization mixture and put 30-50 μl directly on the sample. Put a glass slide carefully on the drop without making bubbles. Put the slide directly on a metal thermoblock at 80 °C, 5 min. Hybridize in a humidified chamber, 2 h, RT. Remove glass from the slide. Wash with Wash solution I, twice, 15 min. Wash with Wash solution II, 3 times, 5 min. Incubate with DAPI, 2 min, RT. Wash briefly with 1x PBS. Store the slides at 4 °C for short time storage (2 weeks) or at -20 °C. It is recommended to analyze the fluorescence as soon as possible to avoid fluorophore fading. Figure 1. A representative figure of ImmunoFISH stained mouse hippocampus tissue. 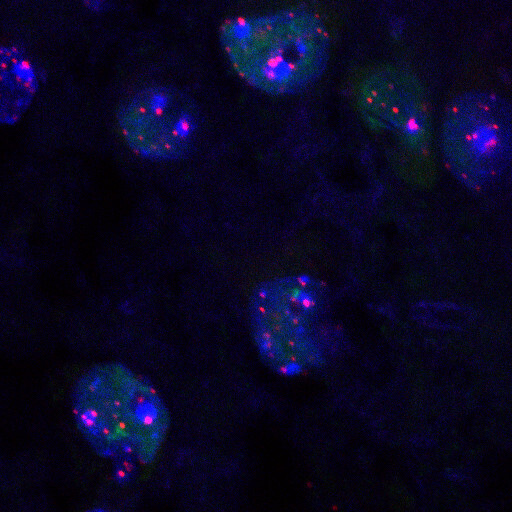 DAPI is in blue, 53BP1is in green and telomeric PNA probe is in red. Prepare small aliquots and store them at -20 °C. The immunofluorescence part of the protocol is adapted from Le et al. (2010). The F.d’A.d.F. laboratory is supported by FIRC (Fondazione Italiana per la Ricerca sul Cancro), AIRC (Associazione Italiana per la Ricerca sul Cancro), European Union (GENINCA, contract number 202230), HFSP (Human Frontier Science Program), AICR (Association for International Cancer Research), EMBO Young Investigator Program and Telethon. Fumagalli, M., Rossiello, F., Clerici, M., Barozzi, S., Cittaro, D., Kaplunov, J. M., Bucci, G., Dobreva, M., Matti, V. and Beausejour, C. M. (2012). Telomeric DNA damage is irreparable and causes persistent DNA-damage-response activation. Nat Cell Biol 14(4): 355-365. Le, O. N., Rodier, F., Fontaine, F., Coppe, J. P., Campisi, J., DeGregori, J., Laverdière, C., Kokta, V., Haddad, E. and Beauséjour, C. M. (2010). Ionizing radiation‐induced long‐term expression of senescence markers in mice is independent of p53 and immune status. Aging Cell 9(3): 398-409. How to cite: Rossiello, F., Fumagalli, M. and di Fagagna, F. d. (2013). ImmunoFISH for Mice and Baboons Frozen Sections. Bio-protocol 3(24): e1000. DOI: 10.21769/BioProtoc.1000.